After dinner, I headed out Highway 25 from Jackson headed to Philadelphia, Mississippi in Neshoba County to check out Jarekus Singleton, the hot new Mississippi blues artist who was appearing at the new 424 Blues Cafe, a venue so new it’s really not even open yet. Neshoba County had a turbulent and violent history during the civil rights movement, but nowadays, thanks to the Choctaw Indians, the county is beginning to look more like Las Vegas, with elaborate casino hotels on both sides of Highway 16 as you approach Philadelphia. When I arrived at the town square, it was evident that there had been some kind of festival going on downtown, for there were cars everywhere, and even some motor homes set up. The new 424 Blues Cafe proved to be beautiful, and rather elaborate, with large central stairs heading up to a balcony overhead. Displays of records and memorabilia in the back pay homage to Otis Rush, the well-known Chicago bluesman who was born in Philadelphia. Every seat was taken, and the place was filled from top to bottom, but Jarekus Singleton had just gone on break when I came inside. When he came back on stage with his band, I quickly saw what all the fuss was about. Singleton is a young and especially gifted guitar player, whose interests run from Hendrix to down-home Mississippi blues. What’s even more amazing is that he was a high-school basketball star before he decided to pursue his music career, and last year was named Blues Artist of the Year in Jackson. Singleton opened his second set with a cover of Stevie Wonder’s Superstition, followed that up with Bob Marley’s “No Woman No Cry” and Marvin Gaye’s “Let’s Get It On”, all skillfully and deftly played, but it was in the slow blues numbers that I was most impressed, for Singleton’s mastery of the electric guitar is rare in someone so young. Singleton took another short break at 11:30, and after I met him briefly, I had to head out on the three-hour ride back to Memphis. Saturday morning in Charlotte had opened with a rain/snow mix that soon turned into areas of heavy snow, but there was little accumulation. Downtown, crowds disregarded the weather and began heading toward any number of day parties, concerts and other events related to the CIAA tournament. Even after I left Caviar to walk back to my car, there were still crowds and traffic jams on downtown Charlotte streets. It was nearly 4 AM by the time I finally got to bed at my hotel. 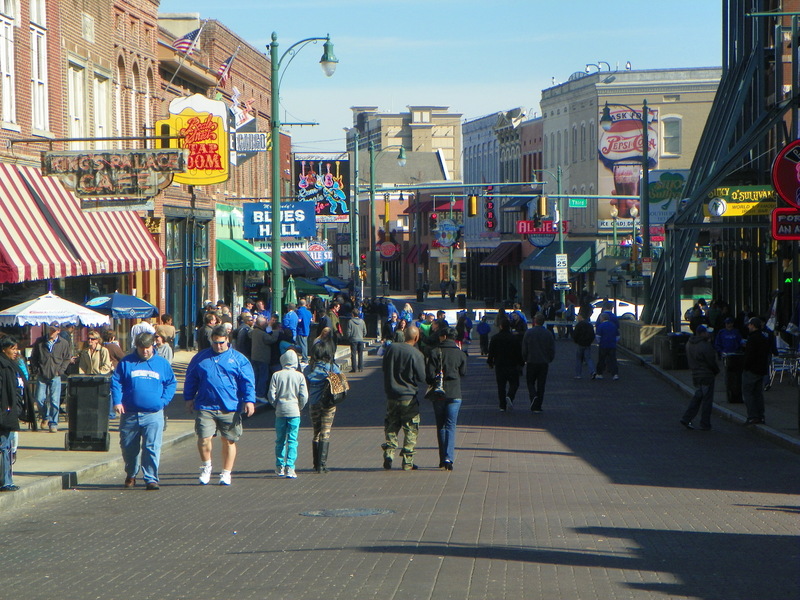 When I walked on Beale Street Friday night, I noticed a drumline setting up at the Rum Boogie Cafe end of the first block. It proved to be the Grizz Line drumline, doing a video shoot and playing cadences for the small crowd that gathered in the freezing cold before the Grizzlies’ game with the Orlando Magic at Fed Ex Forum.